Ola has made enormous strides in the simplifying the travel needs for citizens even in India’s tier-2 and tier-3 cities. And now the company wants to bring the public transportation ecosystem under its fold as well. 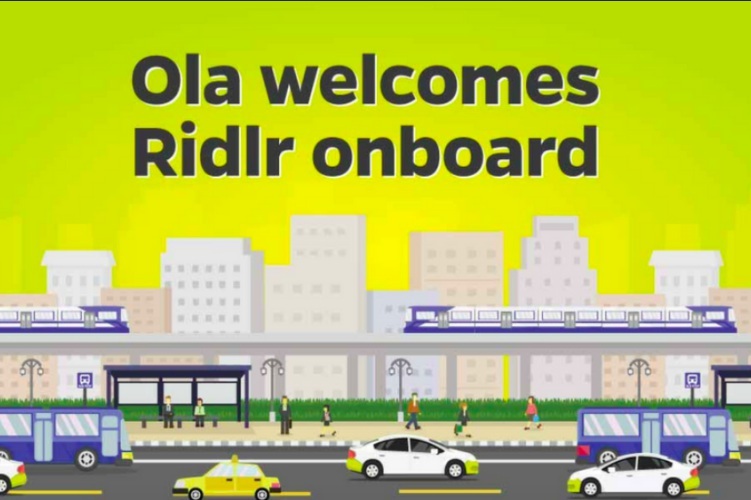 Ola has today announced that it has acquired a Mumbai-based startup Ridlr, which helps in tracking public transport modes as well as transit times for passengers. The financial details of this transaction are currently unknown, but Ridlr’s team of 64 employees will now be joining Ola. This acquisition complements Ola’s continuous efforts to integrate its widespread cab-hailing platform into the public transport infrastructure of the country, which has thus far remained untapped. Ridlr, in a short span, has made huge strides in the [public transportation] space, and this latest acquisition lends muscle to our efforts in making transportation a far more holistic service. I am delighted to welcome the Ridlr team on board and join our mission of building mobility for a billion people. Founded by Brijraj Vaghani and Ravi Khemani back in 2010, Ridlr claims to be the first end-to-end local transit app in India, that can efficiently fulfill public transport ticketing and commuting needs. It has raised close to $6 million from Times Internet, Qualcomm, Matrix Partners, and Innoven Capital, according to Crunchbase. The Ridlr app provides you access to real-time info about roadblocks, diversions, as well as cancellations of trains, metro, and public buses. It also lets you check live arrival times and find the quickest, most convenient routes around cities. It was operational only in Mumbai and Delhi at the time of acquisition. The main benefit of this partnership for Ola will be Ridlr’s proprietary IoT devices which bring digital capabilities to public transportation vehicles in the country. This fills a huge gap in terms of monitoring public transport options, which is a monumental task. The ride-hailing giant will be able to utilize the same to possibly improve its own fleet management backend, as well as improve navigation based on the real-time traffic data gathered by Ridlr’s systems.